Pioneers in the industry, we offer screw conveyor from India. Wide in demand in bulk materials handling industries, Screw Conveyor is widely used for conveying materials. Constructed with a rotating helical screw blade integrated within a tube, this type of conveyor can be installed horizontally or at an angle. 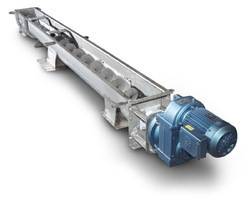 Capable of moving semi-solid materials, these conveyors are abrasion resistant and require less maintenance. Depending on the industry and type of materials, we can customize the screw conveyor for an effective and smooth performance in materials handling work. Other than conveying, these are also capable of mixing, agitating or blending materials. We Have Specialized ourselves in the Design engineering, manufacturers of various Screw Conveyor.